Few people know what hurling is, and even fewer know that Pitt has a club hurling team that plays in multiple tournaments. Every phase of the game resembles a different field sport, all of them mixed into a hodgepodge of open-field violence. Club members, such as sophomore engineering student Joe Koniszewsk, often run into the problem of having to describe hurling using more commonly known sports. As the setup begins, there is the faint specter of a soccer match in the positioning of both teams’ players. They stand around wearing helmets similar to those used in lacrosse — just with wider ear holes — waiting for the match to start. The ball is called a sliotar — white and laced like a baseball, but squishier. Once it’s put into play, the hurlers race around like they would in a game of rugby. The ball is flicked up in the air by the hurley — a club that resembles a field hockey stick with a flat, paddle-like end — and caught in an open palm. After four steps, it’s tossed up and down in a one-handed juggle before it’s thrown out to the hurley side and smashed toward a goal or crossbar. Club hurling at Pitt is played on an all-purpose soccer field using soccer goals and long nets hanging from the ceiling to represent crossbars. Each team is composed of 15 players — one goalie, six on defense, two midfielders and six offensive players. 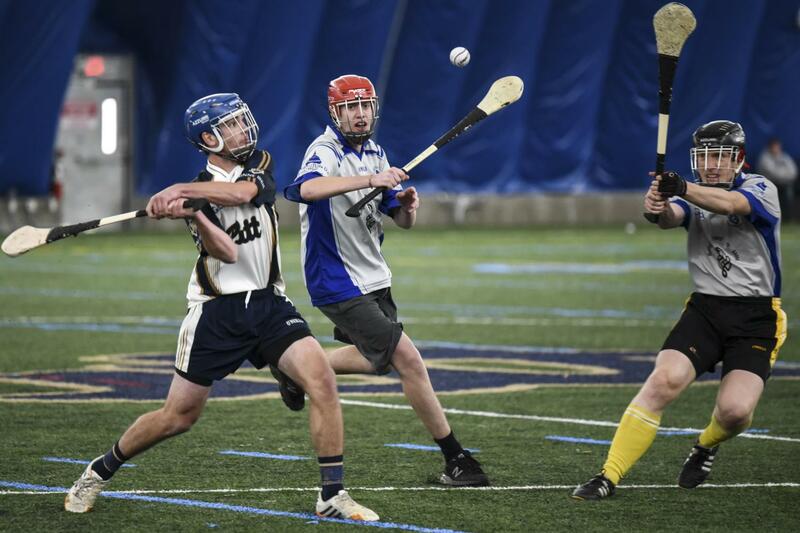 Pitt displayed its team Nov. 11 when the group played Purdue in the National Collegiate Gaelic Athletic Association Midwest Finals in the new Pitt Sports Dome. The Midwest division has only five teams, and the Panthers and Boilermakers are the only two with any truly established footing. The new dome offered a respite for the light smattering of fans bundled up in warm winter coats looking to escape the crisp Saturday morning mid-November weather. The building’s visitors watched Purdue crush Pitt in the championship with the help of some exceptional hurling talent. The moment one of the Boilermakers’ two Irish players got loose with the sliotar, it was sent flying through the air and over the crossbar for a point. Purdue won with a final score of 32-9. To understand the culture surrounding the Pitt club hurling team, you first have to look across the Atlantic Ocean to Ireland, the birthplace of the ancient sport. The earliest hurlers are part of Ireland’s mythology. The legendary figure Cu Chullainn is said to have defeated a fierce hound in combat using hurling equipment. Houriet said hurling started out as a form of tribal warfare, citing stories of ancient tribes killing their opponents after victory. The sport of war eventually turned into something of a game of pride. In modern Ireland, hurlers compete for their local counties without pay, and 14 of the 32 counties have a hurling team that competes in the All-Ireland Hurling Championship. For some, the sense of pride in amateur teams and competition has carried over to Pitt’s club hurling team. Some club members travel as far as Connecticut to represent Pitt in hurling tournaments. Koniszewsk missed the competitive aspect of high school sports when he came to college and was looking for a new team he could join. For Johnston, all it took was to find out that a club hurling team existed to pique his interest. He had seen hurling on TV because of his Irish relatives and finally got a chance to try it himself. While hurling is prominent in Ireland, the club is trying to build popularity at Pitt through fundraising at local restaurants and the activities fair. In the meantime, the small crew of mostly engineers will continue to spend their Wednesday and Thursday nights tucked away in competitive practice on top of Cardiac Hill. As they prepare for nationals, scheduled for the summer of 2018, they do so without much regard for who knows about them.